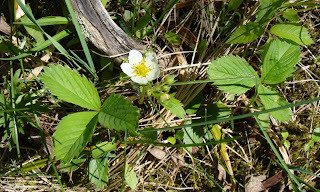 Which has got to be a wild strawberry, hasn't it? There was only the one plant, though, and whether I'll be able to find it again when the flowers have become strawberries is another matter. I suspect the racoons or rabbits will get to them first. That definitely looks like a wild strawberry.We have them growing in our lawn. 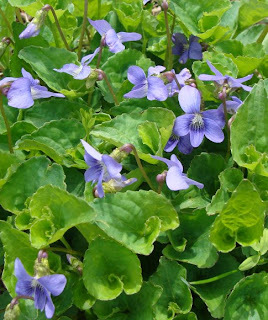 The lawnmower gets to them before the racoons:).You have pretty violets as well.I enjoy the light green foliage of the violets as much as their blooms. I have noticed that the dandelions are HUGE this year and there are millions of them, or so it seems. They are very cheerful, though my husband the lawn guru doesn't like them. I put on my glasses and looked it up in my field guide and it sure does look like a wild strawberry. I keep thinking something else looks like that, but can't remember. That certainly is a wild strawberry. When I was little our property backed up to untamed forests. We used to pick buckets full of wild strawberries and raspberries.